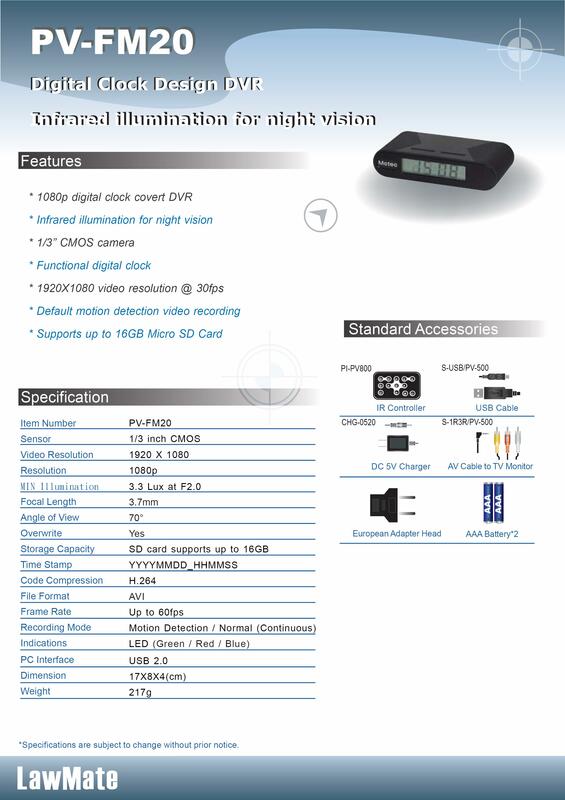 Built into a micro-sized clock package, it's high end covert video results will amaze you. You won't believe your own eyes that such high quality performance and options and be put into such a small package but it's true. This tiny gem renders all other clocks that have built-in covert cameras and DVRs a thing of the past and ready for the Spy And Private-Eye Museum. The PV-FM20 records clear and crisp covert video in 1080p and gives you total night vision recording ability so it doesn't matter what the lighting conditions are! Even with the lights out, you'll capture your covert video in total darkness up to 30 feet away. No Glow IR Records 30 Feet Away! Totally Hidden Camera -You Can Not See It Even Up Close! The displayed shipping price is for '1' 1080P Alarm Clock Radio Covert No Glow IR Camera. To find the shipping cost for all your items, please view your cart.